And how to commit crimes against insects with them. But before you reach for the organophosphates and neonicotinoids, or other carcinogenic and beneficial-insect-killing systemic insecticides that are still permitted for pest control in home gardens, consider less drastic methods. The first step is to look at the garden as an ecosystem, and ask yourself what’s making that particular crop susceptible – the integrated pest management approach. Perhaps it’s been over- or under-fertilized, or stressed by drought. Maybe you can do more to encourage beneficial bugs that will prey on the pests. Or you could accept that some level of predation is a natural part of the cycle of life – “you win some, and you lose some” is the mantra of many a wise gardener. But if you still have the urge to kill those evil little things sucking the life out of your plants, know that there are less-toxic, naturally-derived – but still effective – alternatives to the hard stuff. Here’s what to look for if you suddenly find yourself drawn down the insecticide aisle. Extremely effective at killing aphids and other sap-sucking pests, like mealy bugs, mites, leafhoppers, psyllids, scale insects, thrips, and whiteflies, soap sprays are commonly found in garden centers and online suppliers (you can even order them on Amazon). They are completely non-toxic, killing the insects simply by smothering them with soap, which prevents them from breathing. You can also make your own by mixing one tablespoon of liquid soap in a quart spray bottle – just make sure to use a mild, all-natural soap (like Dr. Bronner’s) to avoid harming the plants. This product, which you can find in garden centers or online, is nothing more than fossilized microbes that have been ground into a powder – a powder that is similar to shards of glass, shredding any soft-bodied insects that slither across it. While soap sprays are good for many soft-bodied flying insects, diatomaceous earth is used for all crawling, hard-bodied insects (those with an exoskeleton), such as ants, spiders, cabbage root maggots, carrot rust fly larvae, cutworms, and onion root maggots. It also shreds the bodies of snails and slugs. Simply spread the powder on the surface of the soil around vulnerable plants. Just be forewarned that there is one major drawback: diatomaceous earth only works when dry, so you have to reapply it whenever it rains. Bacillus thuringiensis, or Bt, is a soil-dwelling microbe that is toxic to many insects, but does not harm people, pets, fish, birds, or other wildlife. It is widely used by organic gardeners to control caterpillars that feed on cabbage, cauliflowers, and other “Brassica” crops, though it is also effective against corn earworms, cutworms, tomato hornworms, and other worm-like pests. 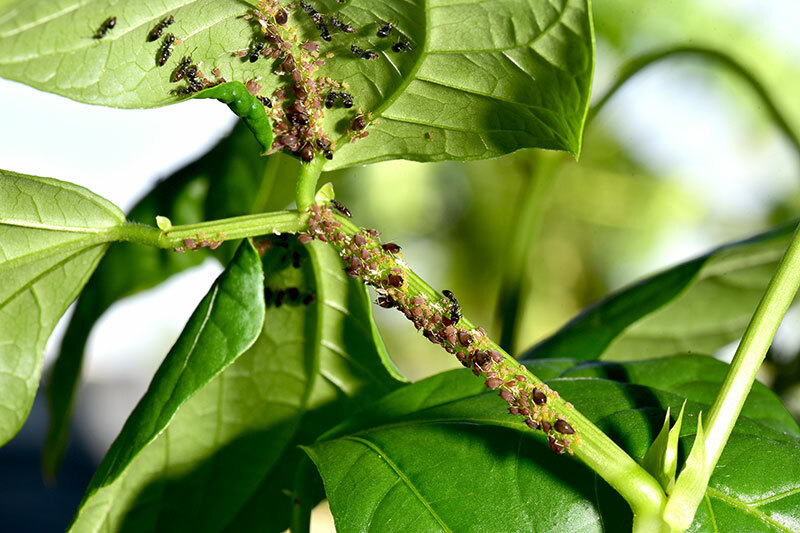 There is some potential to harm beneficial bugs with Bt, and pests can develop resistance to it if it is applied too frequently, so better to use it only on serious infestations. A cousin of Bt, milky spore attacks the Japanese beetle larvae, which are those fat white grubs you’ve probably seen when digging in the soil. The grubs mainly eat the roots of grasses, potentially decimating your lawn, but the adult beetles eat a wide variety of plants, from vegetables and fruit trees to roses and other ornamental plants. If you kill them in the grub stage and they never become adult beetles. Milky spore only has to be applied once; after the soil is inoculated it takes a few years to spread and provide complete grub control, but the effect is permanent. This naturally-derived mineral is the active ingredient in organic snail and slug killers, like Sluggo. The iron phosphate (which is also referred to as ferric phosphate) is coated with an “attractant” that snails and slugs find even more irresistible than plants, but the iron inside acts as a poison. This form of iron, at least in such small doses, is not harmful to people, pets, or the environment, and it holds up better in the rain than diatomaceous earth. Many other slug and snail killers contain a more toxic form of iron, ferric sodium, which is not approved for organic agriculture, though it is often marketed as a natural product – so be sure to read the label. This is one of the best all-purpose natural insecticides, killing everything from cabbage worms and squash bugs above ground to nematodes and grubs beneath the soil. Neem oil is a poisonous extract of the neem tree, a tropical Asian species, which is widely available in garden centers. It often takes repeated spraying to be effective, but neem has relatively little effect on beneficial insects and pests rarely build up resistance to it, as is common with most chemical insecticides. This is one of the most toxic of the natural insecticides, though it is permitted in organic agriculture (though synthetic versions, called pyrethroids, are not). Derived from the pyrethrum daisy, the substance kills most insects on contact and is especially effective on flying insects that are hard to control with other means. It’s not effective on pests that live underground or deep in the crevices of plants, where the spray can’t penetrate. While pyrethrum degrades quickly in the environment and is only mildly toxic to people, pets, and wildlife, it does not discriminate against killing beneficial bugs – so use it sparingly and follow the safety precautions on the label. There are other such botanical insecticides, like rotenone, nicotine extract, and sabadilla, though these are all more toxic than pyrethrum, and in some cases are considered more toxic than some of the synthetic alternatives that are available.